Firstly thanks to everyone for the support on the run up to and after the trip ! OK so weather wasn’t that great but hey why spend all that money on kit if you ain’t going to use it ! 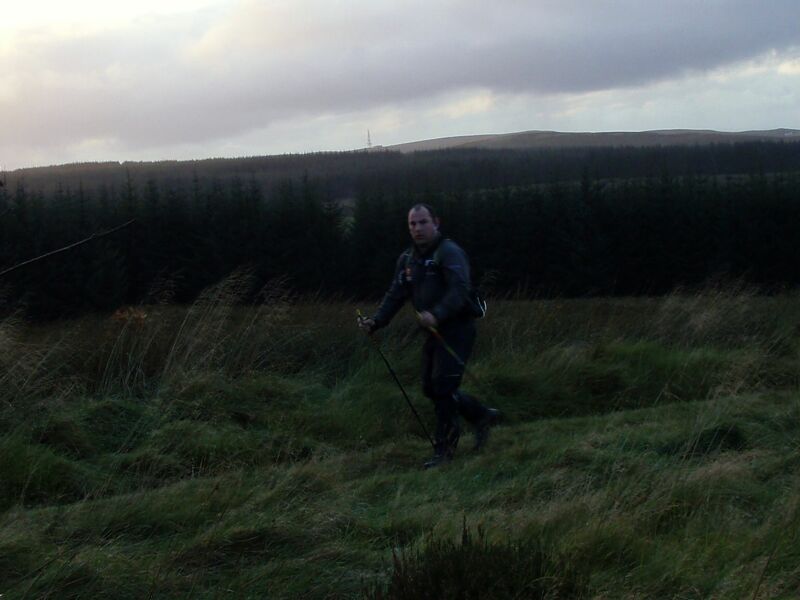 A big thanks to John from Alba Adventures who gave me a lift up and also shadowed me down the route. I left Fort William pretty much on 12 noon, the weather was good, I did try to send a SPOT ping but having just switched it on it didn’t go as it was still trying to find its self. The first bit is just plodding along tarmac wandering when the real path starts and it was good to leave the road and strike out through the woods and then onto the forestry track. The last time I walked this part of the track I was 13 years old and coming to the end of the Way after 5 days !, I also at that time had a 100ltr Berghaus Cyclops on my back ! I passed a few few people going the other way, they looked tired wet and cold ! I tried to send a ping every hour on the hour, but now looking at the map it does not show the 1pm ping ! Next ping was at 14.09 as I dropped out the woods and onto the open hillside, the views were awesome but you could see the track was going to get a little bit more challenging ahead ! There had been a few showers but nothing worth bothering about. The sign said 7.5 Miles to Kinlochleven 3 hours, eh I thought, that’s only 2 hrs max ! The path was like walking up dryish river bed which made it hard on the ankles and hard to get into a fixed pace. A few more showers passed and onto the back of Stob Ban and the rest of The Mamores. The colours were amazing on the hillside with a mixture of greens, greys and orange it kind of reminded me of a Haglofs catalogue ! The picture above was the 15:00 ping but not sure what happened, probably an ID 10T user error ! 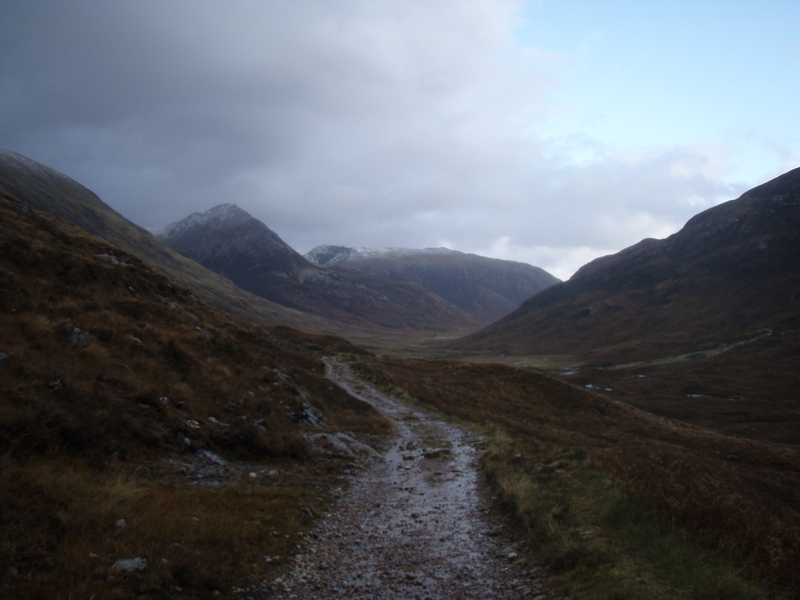 The time was flying in but the miles didn’t, I got to the side of the hill and could see the pipes of Kinlochleven in the distance, I had set my self the goal of getting there for 1600 and it was now 1545. I ran down the tight rocky track and made it to the bridge bang on time. I sent another spot ping but it didn’t show either ! The rain had started and I sent another ping (4) at when I stopped to put my jacket on. The rugged Pants were still shedding water so I didn’t bother with my other shell trousers. The path was now starting to become like a river and my feet were now wet ! I hate having wet feet, but I have learned now that as long as you have good socks on it keeps your feet comfortable when wet then you can deal with it ! The wind picked up and the rain changed to hail, which was getting blown into my face tearing at my skin. The light was going as I got to the cairns at the top of the Devils Staircase, I munched on some jerky and pushed on in a trot down the hill to Altnafeadh. Once on the track next to the road John passed and said he would see me at the Kingshouse. On hitting the tarmac I picked up to a trot, debating on crossing the Black Mount leg through the early part of the night. Next morning John dropped me off just before 7am back at the Kingshouse, the rain was bouncing off the ground and the wind was blowing strong. I had opted to put my waterproof trousers on with my shorts on underneath and leave the mountain pants off so I did not roast (this I will regret later ). The weather was brutal so I stuck the I pod on and disappeared into hood world focusing in on the light spot that the head torch projected. I felt good despite the constant buffering of the gusts, the vast majority of which were hitting me from the right hand side. This went on as I climbed with no respite until a gust that hit me hard from the right stopped backed off to gain strength then hit me front on and knocked me on my arse ! There wasn’t really a sunrise, it just gradually got light and I switched the torch off. I remembered I hadn’t pinged the spot at 8 so sent one around 9 and pushed on after some mixed nuts and Nuun for breakie. Despite the weather I was enjoying plodding on through the hills and surprisingly enough my feet were relatively dry thanks to having dried my boots off in the drying room. The track down to the Forrest Lodge was that horrible slippy cobble stuff and it felt like 2 steps forward one back when the wind blew into my face. A ping at Forrest Lodge and some jerky whilst still moving down the road. It had taken me approx 3 hours to cover just under 9 miles slow going and I was a bit dissapointed. Hitting the climb just passed the Inveroran Hotel I was aware that my shorts were wet under my waterproof trousers, also I could feel puddles of water in my sleeves, the warm glow that the X-Bionic top normally gives had gone ! 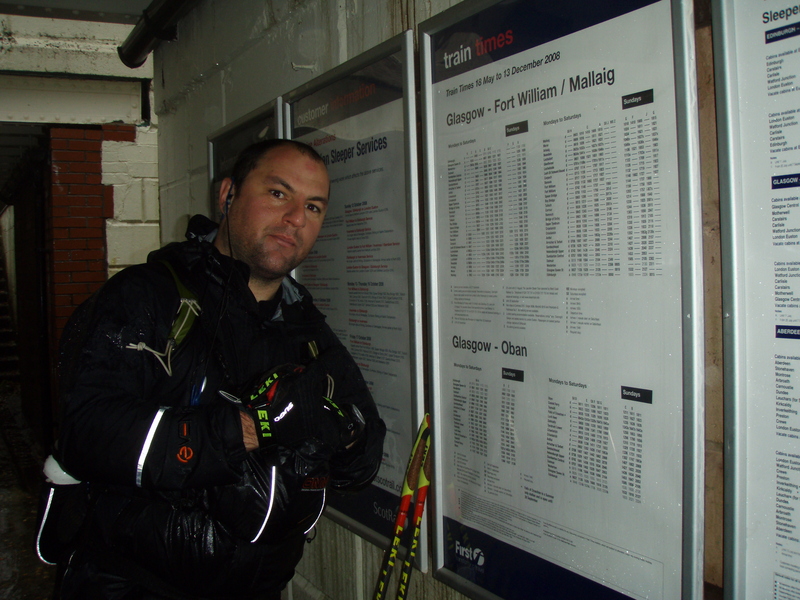 3 odd miles to Bridge of Orchy and another hour passed, I stopped under the Railway line to have a break from hood world and get some food. 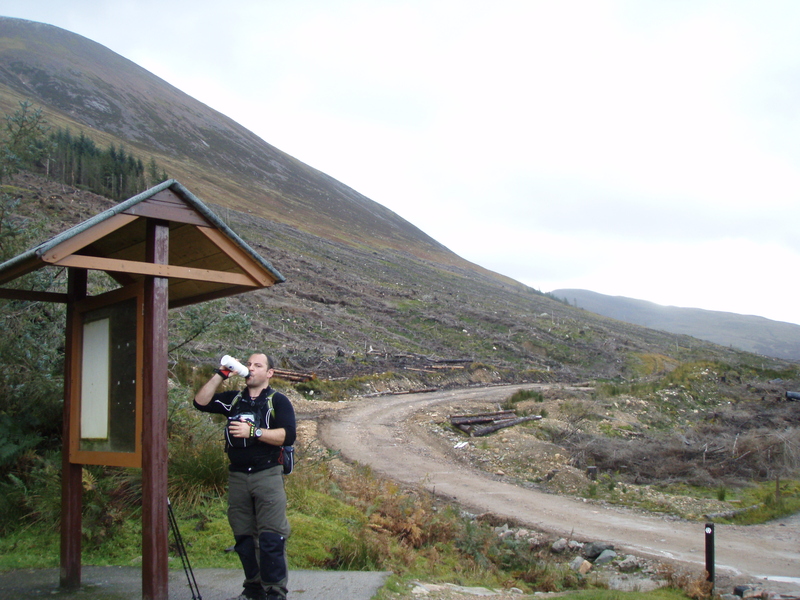 I toyed with the idea of making a brew but decided that due to the slow pace I had to push on to Tyndrum. Whilst stopped a whole load of walkers got off the train and started out in front of me. I set off and decided to try and keep pace with them to try and raise my speed ! The path by this point was just a river, my feet were soaked now and I skirted round the deepest stuff and splashed through the shallow. Approx half way into this stage I started to become aware of a bit of chaffing in the nether regions due to my shorts being soaking now. Again as I passed under the railway I took a bit of shelter had some food and Nuun and set off again. Just before meeting John at Auch I was jumping from tussock Island to Tussock Island between the torrent of water when my heel disappeared down a hole and my toe stayed pointing at the sky ! 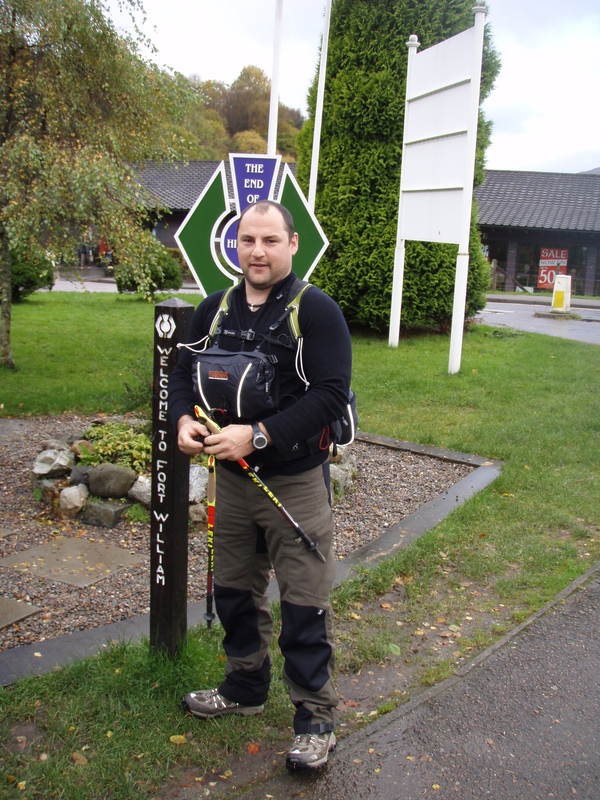 I regained with my poles and walked on, the twinge in my left Achilles was unbearable but I tried to walk it off and it eased as I got to John. I quick chat and the agreement I would get him at Tyndrum and I was off again. The poles became invaluable at this point, not so much for propulsion but to take the weight of my left foot. Another 3.5 miles another hour and I made it to Tyndrum. Coffee has never tasted so good as I sat down to Haggis in the Real Food Cafe. 20 minutes later I walked out with big John and could hardly put weight on my left foot ! The decision was made to quit, not an easy decision but I was not going to risk my Achilles snapping and being stranded some where. It was a ponderous journey back to Glasgow. I text PTC to tell him and got a supporting text back ! I was gutted I felt I had let everyone down and that what hurt the most ! So off to the Sports Injury Clinic Monday morning to see what the damage is and how long I will have to rest up ! Bobinson is of the grid broken and defeated ! Wait for the full story ! After last minute running around and a busy day at work with meeting after meeting I finally get home to pack . All the kit was laid out on the table to ensure nothing was forgotten. After a couple of re packs it all was in and everything was in Logical places in the pack. Its tight but all there. I opted for the Omm front pouch just to keep the camera and munchies handy, the spot is in there too. The forecast has changed and looks like the wind has blown itself out a bit ! Snow is still fore-casted but hey its supposed to be an adventure ! Montrail Hardrock mids never made it here on time so will be in the North Face mids ! Catch you Monday for the write up ! I just checked out the weather forecast for the weekend and it really is a mixed bag of rain snow and gales ! Good job I picked Oct then for this trip ! I have ordered bits and bobs for the trip and they are starting to appear in the post at long last. I ordered some Jerky from The Scottish Jerky Company I have not tasted it yet but there is a mixture of Venison and beef flavours that can only be better than the crap you get robbed for in the supermarkets ! 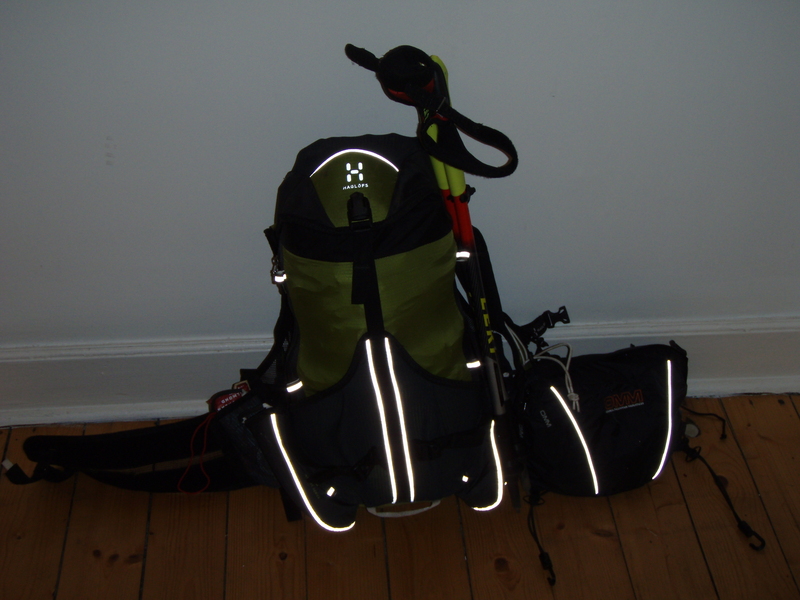 I have been carrying 7kg in the Haglofs Endurance and have had a bit of a problem with the shoulder straps slipping and going loose ! also and most annoyingly the chest strap creeps up and then pops off the shoulder strap. It goes back on but is very fiddly and would be impossible with gloves on ! Clothing is still a big unknown especially leg wear ! 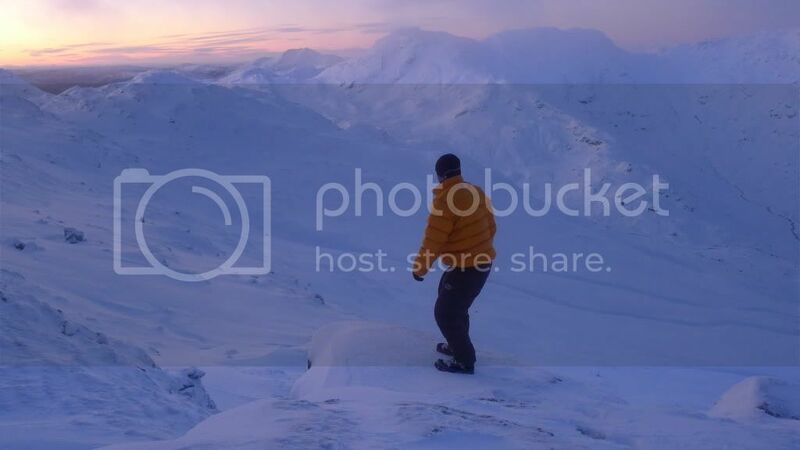 I am toying with the idea of having thermal leggings on with Montane Terra Xt’s on top ??? The past couple of nights I have had shorts on under the Terra XT’s and been toasty, but looking at the forecast the worst is still to come ! 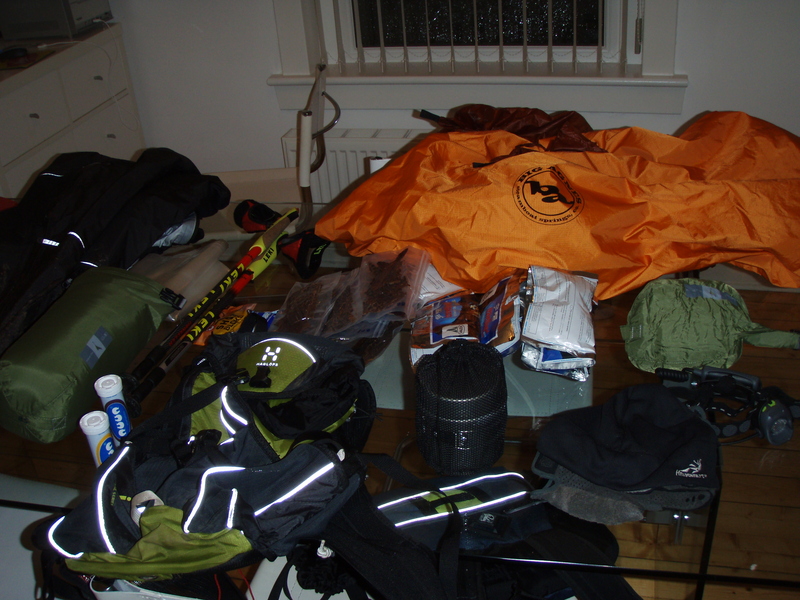 Kit is lying all over the dinning room as it gets laid out checked and prepared to be packed. My Hardrock Mids have been dispatched from the States but not been delivered ! hey its only Tuesday. Fingers crossed that arrive and I get get it operational on time with Google Maps so that my progress (or lack of it can be followed), I doubt I will get the numbers that Petesy achieved but it will be fun to watch on return. Sponsorship is doing OK with £160 on the just giving site and Approx £150 on the sponsorship form. Yes I know I haven’t updated the blog for 2 weeks after my little low point ! Things have been busy and I have using as much time as possible to cram time on the hill and on my bike. The October week meant early starts and late finishes due to towing the Sailing In The City trailer so trips had to be close at hand with a mixture of bike trips to Pollok Park Mountain Bike Circuit and Cathkin Braes and on foot up onto Eaglesham Moore. I visited my old stomping ground of Muirsheil Country Park and walked up to the old mines, I then decide to “just nip up to Hill of Stake” its not that far ! Forgetting that there is no path and the ground is a mixture of boggy pools and tussocks of heather and grass. 30 minutes later and thighs burning I got to the top just in time to get hit by the rain ! My Montrail Cirrus boots were totally sodden and I cursed not having the Namches on ! I legged it down the hill falling into a bog disguised as a patch of moss (which was floating) disappearing right up to my Boll*cks in freezing stinking water ! Once back on the mines track I returned on a mixture of running and walking, passing walkers in 15 layers,hats and gloves on looking at me in disbelief that I was wearing shorts and a short sleeve thermal ! I also ventured up into the hills behind Fintry, I have never been on that side so it was good to explore new ground and scope out some future trails. 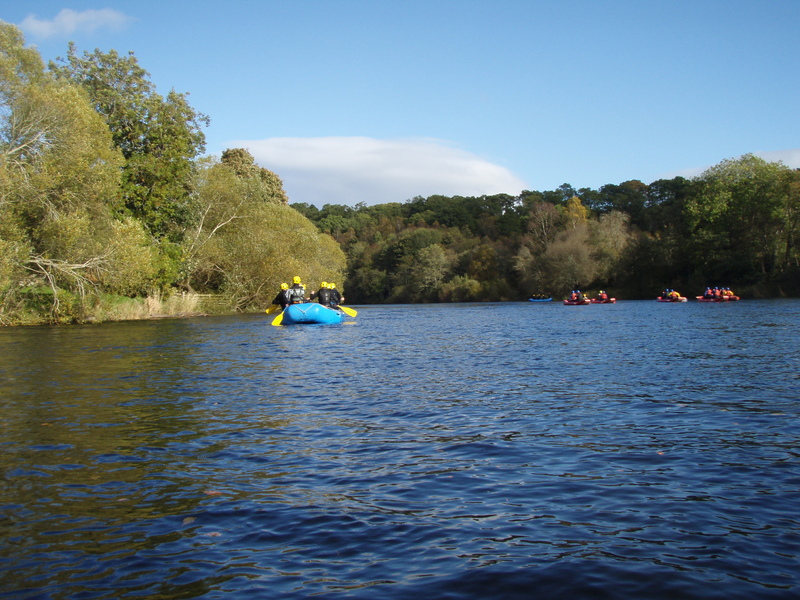 I was on the river this Saturday working and it was definitely Dry Suit weather ! My old Namches have become my boots for wearing on the river and really do work well as the water drains freely stopping the heat loss for the feet (thenamches still live on !). The sun was shining and the River fairly high, this gave a pleasant change being on the water rather than on foot. I have always loved Perthshire in the Autumn as the colours are amazing !